PREFACE TUE Pali language is one of the Prakrits, or Aryan vernaculars of ancient India. It was spoken in the sixth century before Christ, and has therefore been a dead language for considerably over two thousand years. I see no reason to reject the Buddhist tradition that Pali was the dialect of Magadha, and that it was the language in which Gautama Buddha preaohed." Originally a mere provincial idiom, the Magadhesc tongue was raised by the genius of a great reformer to the dignity of a classic language and is regarded by Buddhists with the same feelings of veneration with which a Jcw of the present day looks upon the language of the Pentateuch. A language is generally what its literature makes it. Had Gautama never preached, it is unlikely that the Magadhese would have been distinguished from the many other vernaculars of Hindustan, except perhaps by an inherent grace and strength which make it a sort of Tuscan among the Prakrits. 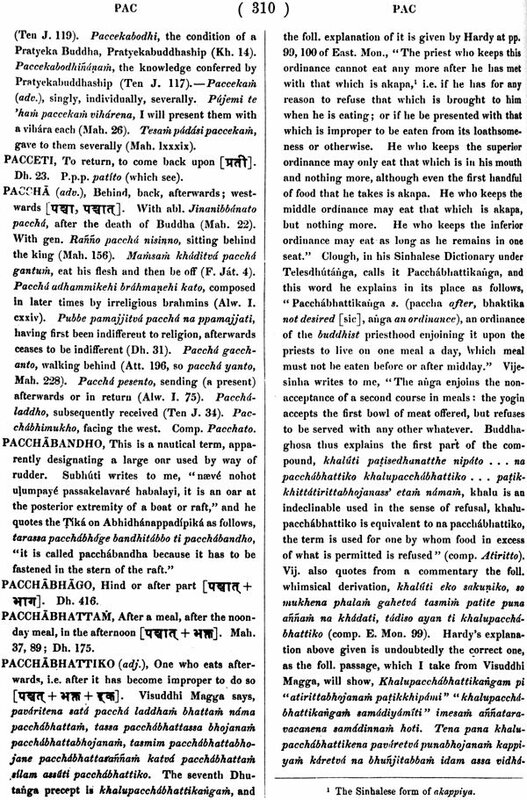 The existing Pali literature is of great extant and im- portance; it is valuable alike to the philologist, the historian, the student of folklore, and the student of comparative religion, A considerable portion of it is known to u in outline, but only the merest fraction has as yet been published textually. It ma broadly be classed under three heads: first the Buddhist Scriptures, which are the oldest Buddhist writings extant; secondly the commentaries of Buddhaghosha, which date only from the fifth century A.D., but are based upon records of great antiquity and thirdly, historical, grammatical and other works, varying in date from the second, or third century to the present day. The Buddhist Scriptures are called Tripitaka, "The Three Baskets or Treasuries," and are divided into Vinaya, Sntra and Abhidharma, or Discipline, Doctrine I am Metaphysics. The Vinaya Pitaka contains the laws and regulations of the Buddhis priesthood, and forms a great code of monastic discipline; it is besides rich in history- and folklore, and contributes innumerable details of the life and ministry of Gautama The Sutra Pitaka consists chiefly of sermons preached by Gautama, and in some in. stances by his apostles," but it also contains other matter, as the Jataka tales, the Niddesa attributed to the apostle Sariputra, and Theragatha" a collection of stanzas uttered on different occasions by eminent saints. In the Abhidharma we find metaphysics pressed into the service of religion: it introduces no new dogma, but discusses the various doctrines of Buddhism from a metaphysical point of view, employing a terminology of great wealth and precision." The Three Baskets form a canon of Holy Writ, and art invested by the Buddhists with all the sanctity of a canon. They are reverenced as containing the Word of Buddha, and are the ultimate appeal on all questions of belief aid conduct. Owing to their great extent, estimated at eleven times that of our own Bible, they are able to treat in great detail of all the relations of life, and the doctrine they contain is consistent throughout and set forth with clearness and logical accuracy. Upon the important question of the origin of the Buddhist Canon much has been written, and the most conflicting opinions have been expressed. The time has hardly come for dogmatising on this subject, but the tendency of all recent discoveries is to confirm the Buddhist traditions, which assign to the Canon a venerable antiquity. The Tripitaka bears every mark of recension, and according to the Buddhist historians this recension dates from the 3rd General Council of Buddhism, held under the emperor Asoka in the year 309 before Christ,' But even this is said to be a mere revival of the first recension which was made in B.C. 543, just after Gautama's death, when his words were fresh in thc hearts and memories of his apostles.' These high pretensions have drawn down, as was inevitable, the ridicule of many Western scholars," more than one of whom has held the Buddhist sacred books to be late compilations, scarcely even reflecting the teaching of Gautama. But the question has been placed on an entirely different footing since the discovery last year by General Cunningham of the Bharhut sculptures. These sculptures, which belong to the third century B.C., are illustrations in bas-relief of a great number of Buddhist scriptural subjects, and are accompanied by inscriptions in the Asoka character. Both illustrations and inscriptions are, so far as they have been identified, in perfect accord with the Buddhist Scriptures as we now have them, and in one instance a whole sentence, containing a remarkable expression, which is probably a is quoted from the Vinaya Pizaka. Next in importance to the Tripitaka books are the Commentaries of Buddhaghosha, the history of which is a singular one. When the great missionary Mahendra went to Ceylon in B.C. 307, he carried with him not only the Tripitaka but the Arthakatha or Commentaries,-a whole literature, exegetical and historical, which had grown up around the Tripitaka during the two centuries and a half that had elapsed since Gautama Buddha's death. 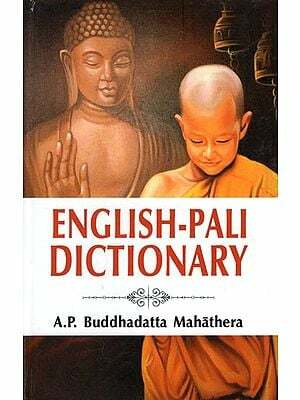 After accomplishing his mission of converting the island to Buddhism, he proceeded to translate these commentaries from Pali into Sinhalese, and his Sinhalese version continued to exist in Ceylon for many centuries, while the Pali version disappeared. In the fifth century Mahendra's Sinhalese commentaries were retranslated into Pali by the famous divine Buddhaghosha, one of the most extraordinary men that Buddhism has produced, and this third version is the one we now possess, the Sinhalese original having in its turn disappeared. Buddhaghosha did not confine himself to translating Mahendra, but incorporated other old Sinhalese chronicles existing in his time, and added immense contributions, chiefly exegetical, of his own. Much of the matter his commentaries contain is as old as the Tripitaka itself, while like the Tripitaka they are rich in history and folklore, and abound in narratives which shed a flood of light on the social and moral condition of ancient India. The remaining Pali literature is of very varying interest. The mere titles of the books ancient and modern which it embraces would fill many pages, and it will be sufficient here to mention a few of the more noteworthy. First in importance are the two famous histories Dipavainsa and Mahavamsa the discovery of which made the name of TURNOUR illustrious, and which are almost our only authentic sources for the history of India previous to the Christian era. Next in order of interest should undoubtedly be named the Milinda Panha, or Questions of Menander. Whatever be the origin of this remarkable work, there can be no doubt of its great antiquity, for it exhibits a familiarity with Greek names and places, and records a religious discussion between the Buddhist divine Nagasena and a 'Yona' king Milinda, who can be identified with certainty with the Bactrian king Menander.' The latter lived towards the end of the second century B.C., and is stated by the Greek historians to have ruled over part of Hindustan. Buddhaghosha's Visuddhi Magga or Path of Holiness is next deserving of mention. It may fairly be called an encyclopedia of Buddhist doctrine, and is a truly great work, written in terse and lucid language, and showing a marvellous grasp of the subject. The Pali grammatical literature is very extensive, and centres around the famous gram- mar of Kachchayana, which is unquestionably the oldest Pali grammar we possess, though its exact date cannot at present be even approximately fixed.' There are probably as many as sixty or seventy standard grammatical works in Pali, and minor ones even now from time to time issue from _ the native press in Ceylon and Burmah. Dictionaries in our sense of the term there are none, but in Abhidhanappadipika we have a vocabulary of nouns of the highest authority, compiled on the model of the Sanskrit arnarakosha by a learned Sinhalese priest of the twelfth century. The Pali Tikas, which form quite a literature in themselves, are commentaries, chiefly exegetical, by different authors, and belonging to different periods. They are of unequal authority, but some of the more ancient ones contain an immense deal that is valuable. They comment not only upon the Tripitaka, but upon almost all the standard books, and the Tika. 's on the commentaries of Buddhaghosha are often of great utility in clearing up obscure passages in those writings. The Pali books on such subjects as prosody, rhetoric and medicine are mostly very modern, and formed upon Sanskrit models. Among doctrinal works may be specially mentioned Sarasangaha, a modern compilation very popular in Ceylon, and Abhidhammatthasangaha, a masterly analysis or compendium of the Abhidharma, by a modern Burmese scholar named Anuruddha Acharya, whose work shows that the spirit of Buddha-ghosha is by no means extinct among his successors in these latter days of Buddhism. The Pali or southern version of the Buddhist Scriptures is the only genuine and original one." To a great pioneer of science, BRIAN H. HODGSON, is due the discovery in Nepal of an extensive Buddhist literature in the Sanskrit language, which at one time was generally considered to present Buddhism in its oldest form. This view is even now not without adherents of deserved reputation, but our increasing familiarity with South Buddhism is rapidly rendering universal the belief that the North Buddhist books have no claim to originality, but are partly translations or adaptations of the Pali sacred books, made several centuries after Gautama's time, and partly late outgrowths of Buddhism exhibiting that religion in an extraordinary state of corruption and travesty. Pali scholarship is a science of comparatively recent: origin, and is the joint creation of two illustrious scholars, a Frenchman and a Dane. BURNOUF has left us the splendid legacy of his 'Introduction a l'Histoire du Bouddhisme,' and of his' Lotus de la Bonne Loi,' and FAUSBOLL, still in the meridian of life, is even now crowning his great services to Pali scholarship by an edition of the entire Jataka. Among the less eminent Palists the first place is due to the venerable LASSEN, and the next to SPIEGEL, who shares with Burnouf and Lassen the gratitude felt towards a pioneer. Nor must I omit to record the name of CLOUGH, for poor as his Pali Grammar appears to us now, we must remember that it bears the date 1824, and as a grammar remained unsuperseded for more than thirty years. And to come to more recent labourers, I would venture especially to mention the services of that distinguished scholar ALBRECHT WEBER, of SENART the first. editor of .Kachchayana,, and of the younger KUHN, the promise of whose early efforts has been amply fulfilled in his newly published treatise on Pall Grammar. The brilliant erudition of MAX MULLER bas been devoted rather to Buddhism than to Pali philology, but in his' .3uddhaghosha's Parables' he has given a valuable contribution to this study, and one which I trust will not be his last. If we compare Pali with classical Sanskrit, we find that about two-fifths of the vocabulary consist of words identical in form with their Sanskrit equivalents, as naga, Buddha, nidana. Nearly all the remaining words present a more or less late or cor- rupted form. The change is in some instances slight, as when sutra becomes sutta or Prajllpati becomes Pajapati; but there are extreme cases it, which the change is so great. that the identity is not at first sight apparent.' Words of the above two classes nearly exhaust the Pali vocabulary; but there remains a small though important re- siduum of forms distinctly older than classical Sanskrit, and found only in the oldest known Sanskrit, that of the Vedas.! May, I do not feel sure that Pali does not retain a few precious relics older than the most ancient Sanskrit, and only to be explained through the allied Indo-Germanic Ianguages. 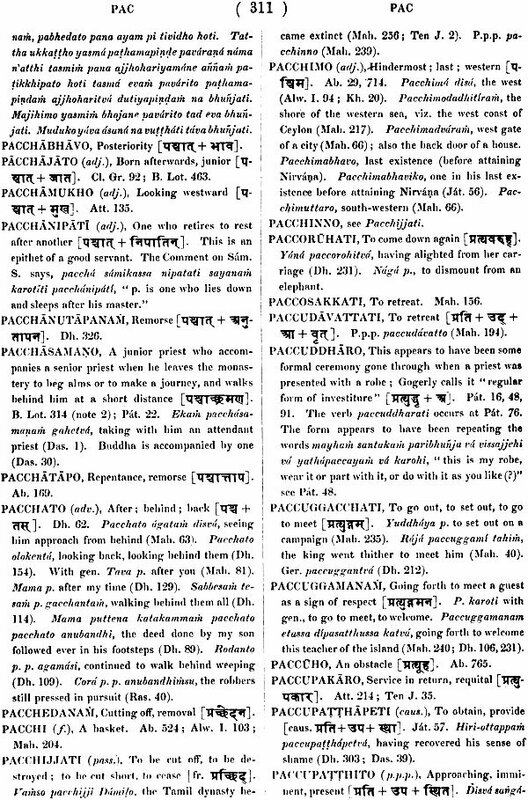 It results from all this that Pali cannot be derived from Sanskrit; both, though most intimately connected, being independent corruptions of the lost Aryan speech which is their common parent; but that Pali is on the whole in a decidedly later stage than Sanskrit, and, to adopt a metaphor popularized by Max Muller, stands to it in the relation of a younger sister. If the proud boast that the Magadhese is the one primeval language fades in the light of comparative philology, Buddhists may console themselves with the thought that the teaching of Gautama confers upon it a greater luster than it can derive from any fancied antiquity. The parallel between Italian in its relation to Latin and Pali in its relation to Sanskrit, is striking enough to deserve special notice. In the thirteenth century the literary language of Italy, the language of culture and science, was Latin, which however had long died out as the spoken tongue of cultivated society, and was probably reserved for the drama, and for occasions of state and ceremony. The spoken language of Italy was to be found in a number of provincial dialects, each with its own characteristics, the Piedmontese harsh, the Neapolitan nasal, the Tuscan soft and flowing. These dialects had long been rising in importance as Latin declined, the birth-time of a new literary language was imminent. Then came Dante, and choosing for his immortal Commedia the finest and most cultivated of the vernaculars, raised it at once to the position of dignity which it still retains. Read Sanskrit for Latin, Magadhese for Tuscan, Gautama for Dante, and the Three Baskets for the Divina Commedia, and the parallel is complete. There is strong evidence that ill .Gautama's time Magadha was one of the most important centres of Hindu civilization, and it is far from improbable that its language was the most esteemed of the Prakrits, just as the Tuscan was the most esteemed of the Italian vernaculars. Like Italian, Pali is at once flowing and sonorous: it is a characteristic of both languages that nearly every word ends in a vowel/ and that all harsh conjunctions are softened down by assimilation, elision or crasis, while on the other hand both lend themselves easily to the expression of sublime and vigorous thought. 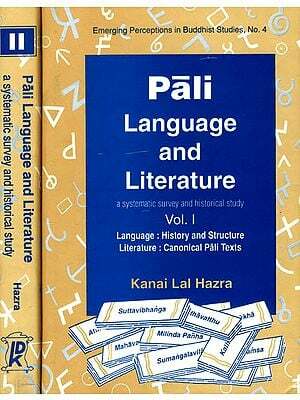 The change which Pali has undergone relatively to Sanskrit, though considerable, is almost wholly confined to the vocabulary. And here the parallel between Pali and Italian stops short, for the latter, owing chiefly to foreign influence, has passed into an entirely new grammatical stage; and even looking only at its vocabulary, it is decidedly in a more advanced stage of phonetic decay than Pali.! The losses which Pall has undergone are by no means inconsiderable. Its alphabet is deficient in the.vowels ri ri jiand Ji, the diphthongs ai and au, and the consonants s,, sh and visarga. The dual is lost in both declension and conjugation," and two of the tenses (the Periphrastic Future and the Benedictive) are wanting. Some of the verbal roots are unrepresented in Pali, of others only traces remain, and a host of verbal forms have disappeared. A large number of nouns are also lost, and such agencies as assimilation, vowel-shortening and the elimination of one out of two or more conjunct consonants has brought about a real impoverishment of the vocabulary.' But all that Pali loses in one direction, it regains, and more than regains, in another. The dual and the two tenses are easily spared. If some roots are little used, others have sprung into unexpected importance. If many nouns are lost, their place is supplied by a greater number of new ones:' while false analogy has brought into existence new verbal forms that may almost be reckoned by thousands," and latitude of phonetic change makes up for all the losses caused by assimilation and other causes.' The softening or breaking up of groups of consonants, the dropping of final consonants, the absence of rigid rules of sandhi, the absence of sounds like ri, s and au,-all this gives to Pali a softness and flexibility for which we may gladly exchange the stately but harsh regularity of Sanskrit. To the above brief sketch I have only to add that, with the exception of a very few imported Dravidian nouns like chati and chumbata, there is no foreign element in Pali.! It is on the whole in the same inflectional stage as Sanskrit, and everything in its vocabulary, grammar and syntax can be explained from the sister tongue," But at the same time it exhibits a remarkable elasticity, a power of enriching itself by throwing out new forms; we may perhaps even detect in it adumbrations of a tendency to pass into a later phonetic stage. 'What Pali would have become had it run on unchecked in its course of decay and regeneration may be seen from the modern Sinhalese, which springs from an idiom closely allied to Pali, and has long passed into the analytical stage.' To a great extent Sinhalese may for practical purposes be viewed as a lineal descendant of Pali, and it has worked out a whole legion of grammatical forms the germs of which may often be detected in Pali, and which make it a rich, though as yet almost unexplored, philological mine." It now only remains for me to express my thanks to the friends who have lent m.- their help and encouragement in my studies, and first of all to Dr. Rost, to whom I have dedicated this work, and but for whom I should never have written a line. I am proud to be able to call myself the pupil and friend of that eminent Palist Mr. V. Fausboll, Towards another Dane, Mr. V. Trenckner, a ripe and graceful Pali scholar, I shall ever entertain feelings of gratitude and ! "espect: from the perusal of no single work do I remember to have derived greater advantage at an early period of my studies than from his masterly edition of the first chapter of Milinda Panha, the manuscript of which (still I regret to say unpublished) was in my hands for several months. I owe a debt of gratitude to my friend Mr. N. Triibner for his enterprise in undertaking the publication of my Dictionary at a time when its success was, to say the least, uncertain; and to my friend Mr. Stephen Aus.tin for the ready zeal with which he has all along seconded my efforts to carry the work quickly and satisfactorily through the press. From three Sinhalese Buddhists I have received valuable contributions in the shape of letters replying to questions on points of scholarship and interpretation. They are, first the priest Dhammarama of Yatramulla, whose premature death in January, 1872, deprived the Buddhist Church of one of its brightest ornaments; next the priest Subhnti of Vaskaduve, well known to European Palists as the able editor of Abhidhanappdipika; and lastly the Mudliar L. Corneille Vijesimha, a scholar of much learning and originality. During the progress of this work I have received from almost all communities in Ceylon proofs of sympathy and appreciation, but from none more than the Buddhist clergy, a generous and enlightened body of men, towards whom I am under many and deep obligations.